Start with the best lamb. I buy Salt Bush lamb from my butcher and get him to de-bone it, leaving only the shank. You can leave the bones if you prefer. Select your best platter and serve your friends and family a dish that they will never forget! Firstly, clean your lamb using a damp paper towel. Remove any fat that you don’t want, but don’t remove too much because fat keeps the meat moist. Clean and peel the onions. Slice them about L/e inch thick and assemble them on the bottom of the baking dish. Sprinkle a little salt and pepper on them and drizzle olive oil. Place the lamb on top. In a bowl, put the salt, pepper, oregano and garlic cloves (halve the garlic cloves as it is easier to insert). Generously sprinkle the seasoning over the lamb on both sides. Using a sharp knife, make incisions all over the lamb. Insert the garlic cloves and a little rosemary into these incisions. Now you need to slice your lemons and place the slices all over the lamb. Cut the whole head of garlic in half and place halves in the baking dish. Drizzle a little olive oil over the top of the lamb. Tear a sheet of baking paper large enough to cover your dish. 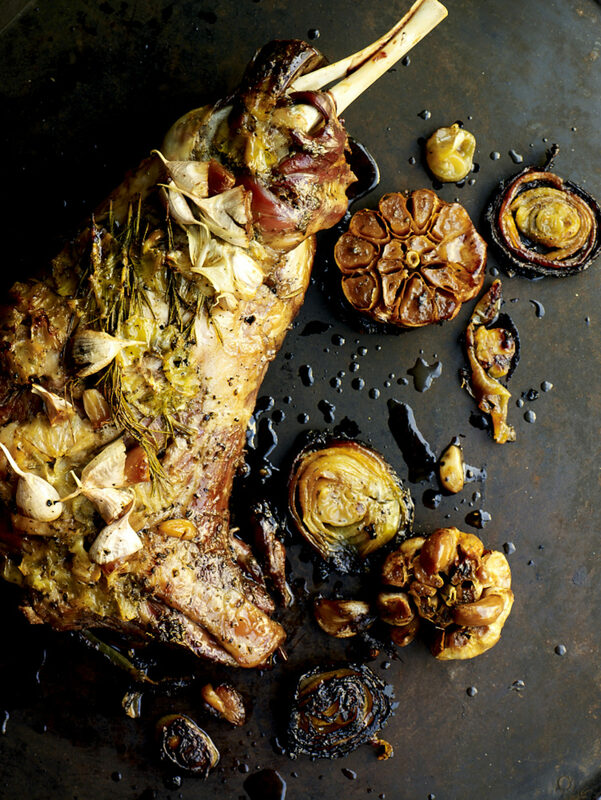 Wet it under a tap, scrunch it up and cover your lamb as though the baking paper were a little blanket. Cover the entire baking dish with foil and put it in the oven. For the first 30 minutes, bake it at 200˚C in a fan-forced oven. Then reduce your temperature to 150˚C and bake for a further 1B/c hours. Remove the foil and baking paper and bake the lamb uncovered for another 30 minutes.